This is the first seasonal trek south Mary Winslow has made since her husband’s death last year, and it will probably be her last. It’s not the same when you’re by yourself. Headed back home early, she’s on her way through San Antonio when she hits something with her RV and her trip takes an unexpected twist. That “thing” Mary hits just happens to be Immortal Dante Notte. Dante and his twin Tomasso were on assignment in San Antonio trying to figure out recent disappearances of Immortals when they were also taken. Having just escaped his imprisonment, the last thing Dante expects while on the run, and naked, is to run headlong into an RV. Things become further complicated when he realizes Mary is his life mate. Now, he’s on the run, naked, having to protect Mary, as well as find his twin, and did I mention he’s naked? 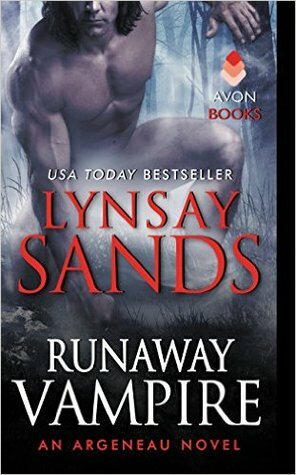 Out of the last couple of books in this series that I’ve read Runaway Vampire does the best with giving background information on the Argeneau’s, Immortals, nanos, etc. So if you’re new to this series this one is a pretty good one to pick up and start, even for being book number 23. With that said, I’m seriously impressed with Lynsay Sands being 23 books into a series and continuing presenting readers with interesting relationship developments. Instead of taking the approach of the heroine being a young twenty, or early thirty, something as we’ve seen countless times, Lynsay Sands decided for Mary to be a little more into her years. Specifically, Mary is sixty-two. And while Dante is quite a few years older than Mary, he looks to be in his mid-twenties. It was this perception on age and the mentality of age that I found interesting. Mary regularly internalizes how her body aches and pains, among other things, yet she reads young. I’ll admit I did a double take when she announces her age. When Mary inevitably is turned, we then see her struggle to acclimate to a new life. She starts the book at what she considers is the downward slope of her life, and now she has to realize she has forever, yet this forever is still at the cost of the life she had. I’d say one of the only complaints I have about the book is the fact that it’s so quick. We barely get a chance to scratch the surface into the depth of Mary exploring the ins and outs of her new life. With her and Dante’s story contained within the pages of this book, there is just no time. It’s like a pick-and-choose, but unfortunately there was a lot I would have liked expounded upon that didn’t happen. The overall storyline involving the missing Immortals is incomplete as well. I can forgive this since, you know, twins. When you have one you have to have the other. It seems Tomasso’s book will be next so I think we’ll get more closure on that end with his book. Even with the feeling of incompleteness I get, I still found Runaway Vampire to be an entertaining read that kept my attention and I look forward to finding out what has been going on with Tomasso.